The Baltimore City Planning Commission approved the almost 150 page York Road Commercial Corridor Action Plan (linked here) on May 21, 2015, making its recommendations for key development sites, community needs, infrastructure and transportation improvements, and urban design part of the city’s comprehensive master plan. The presentation to Commissioners is available here. 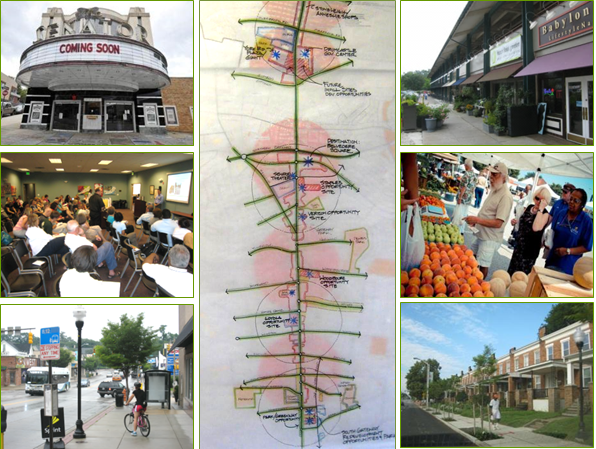 In May of 2014, with support from the Goldseker Foundation, the York Corridor Collective commissioned the planning team of EDSA, Inc., Valbridge Property Advisors and STV, Inc. to develop this Action Plan that builds from the Urban Land Institute Technical Assistance Panel recommendations, Strategic Neighborhood Action Plan updates and other past community engagement efforts. The York Corridor Collective, EDSA, Valbridge and STV team members made a conscious decision to work as one unified team meeting bi-weekly throughout the summer of 2014 to collectively build a vision and action plan for the corridor that would have community leader support, backed by professional input and personal experiences to inform the process. This teaming effort has culminated in this Action Plan which establishes a solid vision and blueprint of commercial corridor action items for the for the York Corridor Collective (YCC) team (and eventually for a new York Road Business Improvement District) to share with property owners, businesses, communities, institutions, the City of Baltimore, and potential investors. In June of 2012, interested parties from the City of Baltimore, Govanstowne Business Association (GBA), York Road Partnership (YRP), Baltimore Development Corporation (BDC), 4th District Councilman Bill Henry’s office, Notre Dame University of Maryland, Morgan State University, Loyola University Maryland, and Cross Street Partners began meeting to vision a future for the York Road commercial corridor. Following a series of meeting in November of 2012, this collaborative group agreed to pursue and finance an Urban Land Institute (ULI) Technical Assistance Panel (TAP) with an approximately 4 mile parameter of the commercial strips from 39th Street in the City to Towsontown Boulevard in the County. By spring of 2013, additional interested partied included Baltimore County, Towson University, and the Greater Baltimore Committee. In June 2013, a group of 8 ULI panelists came together for a two-day TAP process beginning with a tour of the area, continuing with interviews with diverse community stakeholders, and concluding with a public meeting. ULI Panel members shared their findings and recommendations with the over 100 residents, business owners, property owners, and other stakeholders present at the public meeting. Herein, panelists present a vision to zip the corridor together, make overall recommendations to strengthen the four diverse commercial nodes, pose a framework strategy and develop targeted approaches to implement commercial corridor revitalization. York Road TAP Report and Presentation available here. In June of 2012, interested parties from the City of Baltimore, Baltimore Development Corporation, Govanstowne Business Association, York Road Partnership, Notre Dame University of Maryland, Loyola University Maryland, and other stakeholders began meeting to vision a future for the York Road commercial corridor. In November of 2012, this York Road Commercial Revitalization Planning Team agreed to collaboratively finance an Urban Land Institute (ULI) Technical Assistance Panel from 39th Street in Baltimore City north into Baltimore County. In the spring of 2014, as part of the recommendation from the Urban land Institute Technical Assistance Panel, the York Road Commercial Revitalization Planning Team was renamed and organized to be the York Corridor Collective (YCC), consisting of twenty- members representing twenty organizations and two support members from Loyola University Maryland. For more information about the Corridor Visioning Process, please visit their website.